In this example, say that you have a Blogger blog that is http://yourblog.blogspot.com and would like to migrate it to Self-Hosted WordPress with custom domain name newdomain.com. If you have EBiz Linux Hosting account, you can login to your cPanel > Fantastico De Luxe > WordPress and install a temporary WordPress installation. 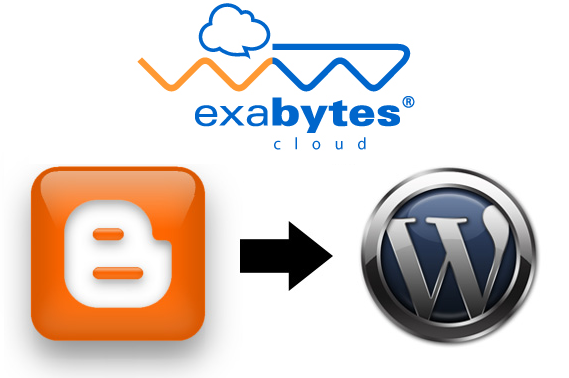 You may also download WordPress installer from WordPress.org and install it manually. This temporary WordPress installation is used to import all your blog posts and comments and to test and see if all your blog posts and original Permalinks or URL’s are being maintained. Authorize the Importing process by ClicklingAuthorize button. You’ll be shown a list of all the blogs you own on blogger and the number of posts and comments. Click the blog that you want to import. Once you click the import button you’ll see a progress Bar as the comments and Posts get imported. Once its Done the Text in the Button gets changed to Set Authors button. Click the button. – Check your blog posts in WordPress if they are working fine. Click the top link, Custom domain. Type in your new domain, www.newdomain.com. Save. Now all your links will transfer automatically to your own domain, but you’ll need one more step to transfer your blog home page over. 1. It will not import the images from your blogger.com. It will reference the images which are stored on Blogger server. So you will have to manually upload your image to a new photo sharing service such as Photobucket.com. 2. It will import all your tags as categories. So suddenly you might have tons new categories import to your WordPress at the top level. You will have to manually change them to make it more meaningful.